Dan zenden we u een nieuw wachtwoord. Zoals u weet heb ik destijds na de test met de drone om de 4-bander in de lucht te tillen, besloten deze te houden. Ze heeft eerlijk gezegd lang in de kast gelegen gezien ik niet veel portabel heb gewerkt. Echter sinds een paar weken staat mijn kokermast geïnstalleerd wachtende op de bestelde beam. Nu heb ik geluk dat een alu mast van 10 meter net op 21 meter van de pyloon kan opgesteld worden en daartussen heb ik de HyEndFed gehangen. Voedingspunt hangt op 16 meter (max. hoogte van de kokermast, het is een 3 x 6) en slopend afzakkend naar 10 meter achteraan. De antenne hangt volledig vrij boven de daken. Ze presteert gewoonweg héél goed op deze wijze. 2/ op die hoogte en grotendeels horizontaal minder last van qrm en vervuiling in de ether. 3/ signalen op 20/40 zijn imposant en veel beter dan op geringe hoogte. Hierbij nog een paar foto's. U mag deze tekst en foto's altijd op de website bijvoegen. now I have install my HyEndFed 80m Monoband. Works great . Have worked the first day S21ZEE on 80m CW. I have cut 1 meter from the wire. Now my minimum SWR is on 3.600 Mhz. to a tree how is 7m long. The last 1,5 m from the wire is in parallel to the tree. I have also grounded the antenna to my metal-roof of the house. 1KW output is no problem from my SPE Expert 1K-FA. De SWR op 160m is prima : bij mijn opstelling is de SWR op 1.845 MHz 1:1.3, op de rest van de 160m-band is de SWR iets hoger maar makkelijk met de ingebouwde tuner van de ICOM IC-7600 te corrigeren. Het uitgaande vermogen is over de gehele band meer dan 90% (gemeten achter de tuner). Gisteren, vrijdag 24 februari 2017, tijdens de 160m-contest waren de ontvangen signalen ook meer dan geweldig, S9+30dB en meer waren geen uitzondering. Op 80m ligt de resonantiefrequentie rond de 3.730 MHz, maar ook hier kan ik met een kleine aanpassing van de tuner op de gehele band geweldig uitkomen : de rapporten die ik gisteren kreeg van enkele Nederlandse stations op 3.630 MHz (PA3ANG, PA1AJB en PA3HFT) waren overweldigend : 59+20dB en meer. Al met al ben ik zeer content met de 160m HyEndFed-antenne, voor mij een perfecte antenne voor de radio-experimenten en contesten. Een hartelijke groet en bedankt voor dit geweldige mooie product ! I connected the very tiny WSPRLite TX ( http://www.sotabeams.co.uk/wsprlite ) to the HyEndFed Antenna and compared it with my vertical Diamond CP6-R Antenna connected to my Yaesu FT-991. See attached DXPlorer Screenshot ( http://dxplorer.net ), but please keep in mind, the WSPRlite TX max. RFPower is only 200mW, while the FT-991 min. RFPower can only be set to 5W ! The other screenshot (WSPRNet-last24h) shows all the stations which heard my WSPR Signal in the past 24h. I find it quite impressive to see that the signal with the HyEndFed and only 200mW is being heard in the US ..! So I must see I am very happy with my new Antenna from you ! the top of a mast extension for my sat dish, about 2m above the top of the house, approx. 12 to 14 meters above ground. It slopes down to a height of 2,5 meters, stretched across my back yard into the empty next door lot, due south. The SWR on 10, 15, 20, 40 meter bands is quite low so that I don't need a tuner. I do have an MFJ 926B autotuner mounted at the base of the sat mast, and the antenna tunes nicely on 80 meters. vertical antenna I had been using previously, and of course my home brew long wire with (ground radials) antenna that was my first HF antenna. I will continue to gather more QSO's and experience with the 5-band EFHWA and give you some more feedback, if you care. The last time in YB9 Bali ( 2014 ) i only have worked on the 20mtr band because that were the propagation was. I had taken a look at www.voacap.com before leaving for Bali and saw that this time the propagation was not all to good on 20mtr. The main operating time for me, and whan there was propagation to EU, was only at 22:00 Loc Bali time. As Voacap allready predicted, the propagation on 20mtr was complety dead and i tried to work on 17 mtr. I managed to work about 55 stations in 90 mins before the window to EU went down again. Two days later i tried the 15mtr band instead and i only managed to work 4 stations in 30mins. I also have tried 20mtr despite of wat the propagation site Voacap mentioned, but also there was NO propagation at all. So the rest of the holiday i worked on 17mtr and was happy that i took the 17mtr mono Hyendfed antenna with me. I can only say about these Hyendfed anyennas that they are GREAT....! On all my trips 9H3A ( Malta & Gozo ) YB9/PB5X ( 2014 & 2016 ) i was happy to work with these mono Hyendfed antennas. They are such an ease to put or hang them up, they have ALWAYS a perfect SWR and they work SO great. That said i am verry happy that i know the guys of the HYENDCOMPANY and want to thank them for there great support & service. So if you are still thinking this summerholiday wich antenna to bring to your summer QTH.....? HYENDFED ANTENNAS will be the answer. The rain is gone and the antenna is installed in a flat top configuration at the condo but only about 5 meters above the ground. The antenna is connected to 75 feet of RG-8X and there is a line isolator at the transceiver end. I shortened the wire by wrapping it around itself as my daily 40 meter net is on 7263 KHz and swr there was initially 2.3 on this antenna. After shortening the wire by about 20 inches. I ended up with swr < 2 to 1 across all four bands. I had left my QRO 40 antenna in it's location at the same height and orientation as the new antenna to compare the two on receive (aware there may be some interaction which is why I wrapped instead of cutting when adjusting wire length) My previous experience with other multi-band end fed antennas was they were usually 1.5 to2 S units lower on receive than my mono-band end-fed half wave antennas. This was not the situation with my new Hyend 4 band antenna. Signal meter readings were the same as on the QRO 40 and if the was a rare difference the 4 band was very slightly higher. After lowering my QRO 40 antenna I did my usual 40 meter net control duties without mentioning that I was using a different antenna. No one noticed any difference in my signal strength. All was normal! Wonderful performance, wonderful quality, wonderful customer service! ps: Thank you for the unique bottle opener. I may have to buy some Heineken to try it out! Hello again guys, just thought I'd give you an update on the 4 band ultralight that my wife bought me for Christmas, now that I've had time to get to know it! I find it's actually 5 bands for me, as no tuner is needed on 17m as well as the stated 40/20/15 & 10m bands. I've been trying it as an inverted V, the apex at 10m, ends about 1.8m above ground, conditions on HF yesterday were not good for me, only 2 UK stations on 40m, got a steady 5/8 report from the north of Scotland. Switching to 20, I had a nice QSO into Lithuania, genuine 5/9 reported. 17m got good reports from Greece and Croatia. I'm very happy with that performance, and quite surprised, as I said conditions were not good on the bands, and my radio was the Yaesu FT817, internal batteries giving me 2.5w SSB! Looking forward to working as SV6/ later in the year! Please feel free to add this short report to my other one on your web-page if you wish, thanks for a quality, easy to use product. Regards, Andy Keddie, M0KED, Lincoln. Firstly, thanks for amazing customer service, very quick delivery, and thanks for the little clog bottle opener! I intend to use the antenna portable, so thats how I tested it, far end on a 10m fishing pole, sloping down to 1.5m at the TXR, and 5m of co-ax to connect. Amazed at the results, using my FT817 there are no SWR bars on 40m, 20m, 17m, 15m or 10m, so I am very happy with the antenna, received signals on 40m, 20m and 17m seemed to be as strong as I would have expected, unfortunately I did not have time to make any QSO's, but I'm sure the low SWR and strong reception point to a pretty good antenna! Thank you so much Ron, I would reccomend Hy-endfed to anyone, great service, great antennas! All the best, Andy Keddie, M0KED. Antenne deze namiddag ontvangen, perfecte service! Heb ze deze namiddag al direct opgehangen en het resultaat is FAN-TAS –TISCH !! Heb al heel wat antennes uitgetest maar dit slaat werkelijk alles op het gebied van draadantennes. Toen ik de reviews las was ik overtuigd maar dit is bijna niet te vatten. Ongelooflijk goed. Proficiat met jullie meer dan uitstekend werk, ik ben in elk geval overtuigd en zal dit ook verder getuigen in de clubs waar ik lid van ben en over de frequentie. Denk me nog een tweede aan te schaffen en zal kortelings de bestelling maken. Ook dank voor het cadeautje, is een zeer gewaardeerde attentie – Mooi! Es scheint schwierig zu sein eine HyEndFed für 20/30/40 m zu erstellen. PA3RK Ron hatte mehre Versuche gestartet. Da ich aber für outdoor am liebsten 30 und 40 m bevorzuge, hat Ron für diesen Bereich eine Antenne erstellt. Die Antenne ist für 100 Watt vorgesehen, ist 16,2 m lang und hat eine Verlängerungsspule für das 40 m Band. Die Antenne kann horizontal oder als Slopper betrieben werden. Material rostfreier Stahl, versilberte BNC-Buchse mit Teflonisolierung, Gehäuse ABS, UV-resistent, Antennenlitze aus hartgezogenem Kupfer. Ich hatte nun in den letzten Tagen (goldener Oktober) Gelegenheit die Antenne im Gelände zu testen. Ich bin sehr zufrieden. Das SWR war im CW-Bereich einwandfrei und ich konnte den KX3 ohne Tuner betreiben. Alle Stationen die ich gehört hatte, konnte ich auch arbeiten. Ich hatte vorwiegend Kontakte mit SOTA/ GMA-Stationen auf den Bergen. Eine schöne Verbindung war mit einer SOTA-Station im Mont Blanc-Bereich. PS: Der Kx3 hat die Antenne auch im 20m Bereich angepasst, der Wirkungsgrad sinkt dann doch. makes me feel confident in the product. 73's de Cesar - PY1SW, in Rio de Janeiro. Hallo, ich bin User einer HyEndFed-Antenne für die Bänder 10, 15, 20 und 40 m.
Höhe gespannt. Die Richtung ist vorzugsweise Ost-West. Das SWR ist auf 20,40 und 15 m 1:1,0 und auf 10 m 1:1,5. Einen Tuner muss ich nicht einsetzen. Auf den anderen Bändern lässt sich die Antenne nicht gut abstimmen- das SWR ist ziemlich schlecht. Die Antenne arbeitet sehr ruhig, die Störungsaufnahme ist im dicht besiedelten Wohngebiet sehr gering. Im Jahr 2013 konnte ich Bestätigungen von 1850 gearbeiteten Stationen aus 141 Ländern erhalten -in den Betriebsarten SSB, cw, RTTY, PSK, JT65,JT9 und SSTV. Die Leistung in den digitalen Betriebsarten beträgt 5 - 40 W. Die Leistung in SSB und cw maximal 100 W- eine Endstufe setze ich nicht ein. In diesem Jahr erhielt ich Bestätigungen aus 98 Ländern von 760 Stationen. Die Antenne ist sehr einfach, außerordentlich durchdacht und arbeitet meist perfekt. wenig Platz und mit geringer Auffälligkeit mit gutem Gewissen weiterempfehlen. Vielen Dank liebe Antennenbauer für dieses Produkt- es schlägt sich vorzüglich. I have bought the HyEndFed 4 band 10-15-20-40 10-15-20-40 custom 400W version and installed as a permanent antenna in my house. Even in the first temporary installation (1 mt from roof), it showed 1:1.2 SWR on 10&15mt, and 1:2.5 on 20&40, with a good efficiency on a local level. Then, once it has been correctly placed in Inverted Vee config @around 8mt height, it has shown minimum SWR on all bands (a bit higher on 40mt) and oustanding RX/TX performance both nationwide, EU and Americas. It is a great antenna and very easy to be put in place. Also, I have appreciated your postsales support and Ron provides outstanding technical help. J Thanks! About the 100 watt UL antenna. Have the antenna get ordered yesterday and it was built and tried out immediately. I was very surprised how well does this antenna, I am absolutely delighted and happy would again convey my thanks. This antenna will be my new travel companion! HyEndFed 12.5m Fibreglass mast - short review. I began previously with a 10m mast for portable DXing from various places in my area. This was actually a 10m flagpole sourced from an ebay seller. It may be light, but unfortunately is also exceptionally fragile feeling and looking; It's survived one winter here in a semi permanent secondary role but I don't see it lasting much longer. It's okay up to a point but only if you use featherweight antennas with it. There's no way I could use it as I'm using my Hyendfed 12.5m mast. 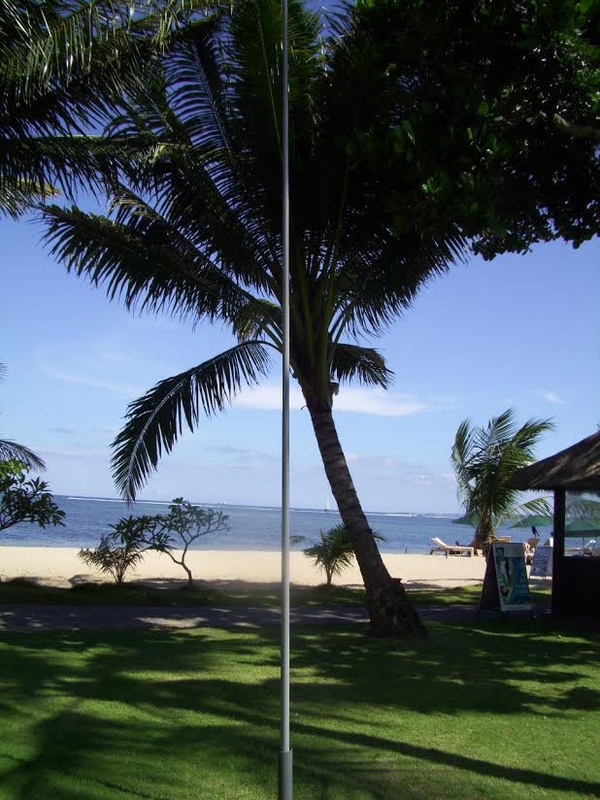 If I had seen this 10m flagpole close up before buying - I would not have bought it. And that's when I decided to look elsewhere, as it appeared that nobody in the UK made - or imported - fibreglass tele-masts made specifically to hold up hefty full sized antennas. First I found the Spiderbeam site and their mast looked good. But I didn't buy right away, decided to look further in case there was anything else available also inside the EU so I didn't have to pay import duties on delivery. Then I found the Dutch Hyendfed site, with its 12.5 metre mast. It's slightly longer, slightly heavier than the Spiderbeam model, and finished in a neutral mid-grey so would not be quite so noticeable as a black one. So I ordered one, and it's everything I hoped it would be. Its sections' engagement-tapers seem to be much less prone to collapsing under load than my ebay flagpole - which used to collapse regularly in use. The wall thickness is much heavier-made than the flagpole I mentioned above. It's an impressive product. Its extra thickness and feeling of being reliable and solid are exactly what I wanted. So far it's held up a full size G5RV on 2 mini-DXpeditions with not a single collapse. It's been admired by friends too. So for me, it's been money well spent. If you are contemplating getting something like this I'd urge you to avoid the weak and thin flagpoles sold on ebay - and especially the even lighter fishing rods (commonly referred to as Roach Poles) which are more common. They are cheaper, but will maybe work out more expensive if you break a couple. Honestly, I don't see my Hyendfed mast breaking in normal service - it's that impressive. I have no business connection with the Hyendfed company in any sense - I'm just a customer who's glad he found this product. Gisteren de 11m end fed opgehangen van de schoorsteen naar de dakgoot. Ik heb de antenne iets moeten inkorten omdat ik vaak op de hoge kanalen werk. Het resultaat was verbluffend. Mijn eerste contact was een Russisch station in Koersk met een rapport 5-9 . ECHT TOP. Mijn verwachtingen zijn echt groot. Received my 3 band QRP End-fed Antenna today. Connected it to my FT-817 and very happy with the performance. Super Mil-Spec quality and components! Keep up the good work. Just to let you know that the 40m antenna arrived today and I put it up this afternoon on top of the building where I live near Cartagena in Spain. We are very high up here and right by the sea so the position is excellent. The antenna tunes perfectly and my first contact with a 5/9+ report was with HB9UQX. My second contact, a few minutes ago, was with JH7MQD near Tokyo who gave me a 5/7 report. I am using an ICOM 7600 with 100 watts so the antenna is outstanding and I am very pleased! here is my feedback. As I said, I 've tested the antenna in the morning. I have worked many us stations as usual. The antenna works good, has low SWR and is very broadband. I will say perhaps as good as my delta loop. In comparisation with my delta loop there is only little or no difference between both antennas with a little advantage for the delta loop. The reports with the well known us stations were almost the same as every saturday morning. The only difference is that the propagation today was better than in the last weeks. The noise level was also almost the same, perhaps a half s unit lower on your antenna. Altogether your antenna is a very good antenna, but it is not an improvement for me. Same reports and the same noise level. But there are two disadvantages, the antenna will handle 1kw, my amp makes 1,5kw but you write on your website you think about higher output antennas. Second is I always have to move the antenna every weekend towards usa and back again to north east for the week. It seems that only vertical polarized antenna has this high noise level and horicontal polarized antennas do not have. But then no dx is possible. Perhaps do mag loops solve my problems. If it is possible I will test during the week with japanese stations and once more next saturday against a mag loop for receiving differences. Normaal gesproken ben ik niet zo van de reviews en juichende verhalen. Toch wil ik nu eens doorgeven dat de 30 meter antenne die ik van jullie heb hangen het uitstekend doet. Hij hangt horizontaal met zelfs een stukje van 3 meter schuin naar beneden. Gisteravond werkte ik er RI1ANT op Antarctica mee. Ruim 15.000 km na 1 keer roepen met 100 Watt. Vandaag op de dag van de amateur de 5 band HyEndFed antenne en de 10 meter mast gekocht. Thuis de mast met beugels voor montage van 70 mm PCV pijp en een paar vulstukjes afval plastic vast gezet aan de schutting achter in de tuin. Het einde van de antenne bij de overgang naar het laatste mast segment met een tyrap vastgezet. Het voedings kastje met een grote boekenplank beugel aan het huis gezet zodat er enige afstand tussen de muur is. Totaal ongeveer anderhalf uur werk met een heel goed resultaat. Het werkt echt heel goed ook zonder antenne tuner. Ik vind het een antenne die ik eerder had moeten aanschaffen, een aanrader dus. In deze mail zal ik een stukje schrijven over de hy end fed antenne die momenteel in Bali is en al wat geweldige DX heeft opgeleverd. We zijn hier al 2 weken en overmorgen vliegen we helaas alweer naar PA. Dus ik zal je binnenkort wel werken op 40mtr. De HY END FED antenne die ik van Rob PA3EKE heb is in een woord geweldig. De antenne is de 20mtr mono band versie. Ik heb op dit moment al 300 QSO's gemaakt als "holiday style" station. Ik heb het geluk dat ons hotel aan de Indische oceaan gelegen is en dat ik een kleine vertical glasfiber mast bij me heb. In combinatie met deze mast en de HY END FED antenne werk ik vrijwel elke dag met zowel korte als lange pad propagatie de hele wereld. Het is gewoonweg zo simpel om een draadje op te hangen, gelijk een perfecte SWR te hebben en startklaar om de hele wereld te werken. HY END FED company bedankt. 73 Roberto YB9/PB5X Bali isl. Beste Rob en Ron / cq mede geïnteresseerde amateurs. Kort geleden kocht ik (Hans PA1KL ) een QRO monoband Hyendfed voor de 20 meterband omdat ik inmiddels door ervaring vertrouw op de werking en duurzaamheid van de hyendfed antenne. Al enige tijd gebruik ik naast mijn inverted V dipool van 2x20 meter met een open lijn ook naar volle tevredenheid twee monoband Hyendfed antennes, te weten een 40 en een 20 meterband uitvoering. De 40 meterband uitvoering heb ik horizontaal op een hoogte van 3,20 meter boven de grond als zogenaamd en bedoeld "NVIS" antenne uitgespannen. De andere endfed voor de 20 meterband werd om een lage afstraling hoek te creëren verticaal bevestigd in een 12 meter lange glasfiber mast. Deze mast stond lange tijd in een schotel-tegelvoet houder (met 8 extra 30 x30 tegels) op de achterzijde van de garage. 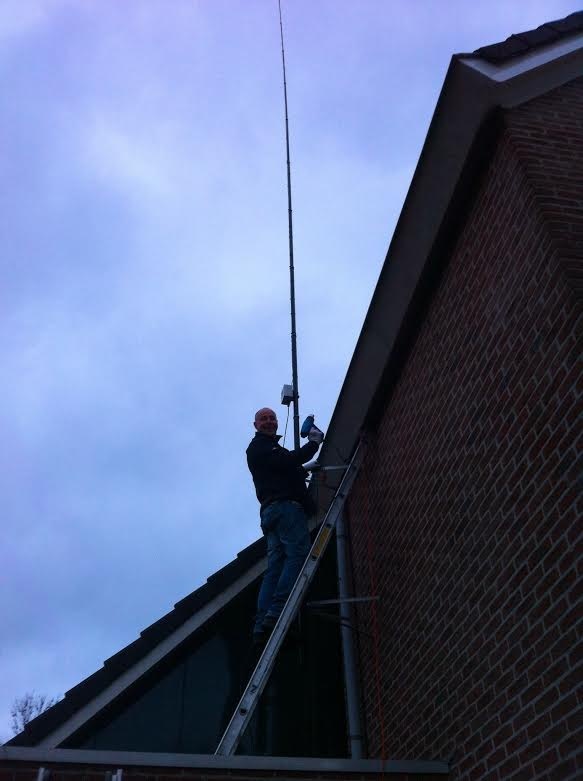 Beide antenne's werken boven verwachting goed! Op de 40 meterband zet ik binnen Europa vrijwel steevast een signaal neer van S9 / S9+. Hoewel laag weg gespannen bezit de antenne op een dergelijke manier uitgespannen blijkbaar ook nog dx componenten, want zelfs van ver buiten europa krijg ik regelmatig mooie rapporten! De verticale "hengel" antenne voor 20 werkt ook echt super goed! "Big booming signal, what are your working conditions?" is wat ik vaak te horen krijg. Zelfs met qrp vermogen zijn de rapporten ook vaak goed, en dat verteld me dan dat het rendement van deze antennes ook beslist in orde is. Dat is in mijn situatie gelet op hoogte en omgeving in elk geval goed, soms beter dan de inverted V.
Hoewel ik voorkeur geef aan qrp vermogen, besloot ik geheel uit nieuwsgierigheid de mono 20 te verruilen voor een qro uitvoering. De mast werd tevens van de garage verplaatst en staat nu (ook iets hoger) tegen de gevel van de woning. Natuurlijk weet ik dat wonderantennes niet bestaan maar deze antennes werken gewoon goed, ik kan ze echt aanbevelen! Ook kan ik doorgaans alleszins goed "meekomen" met amateurs die met beams of een andere opzichtige antennes werken. En eh nee, ik besef me dat ik reclame zit te maken, maar nee voor alle duidelijkheid, ik krijg geen geld van de makers van deze antenne's voor het plaatsen van deze review hihi. Trouwens over de service van deze heren in Almere echt niets anders dan lof. Rob en Ron ga zo door! 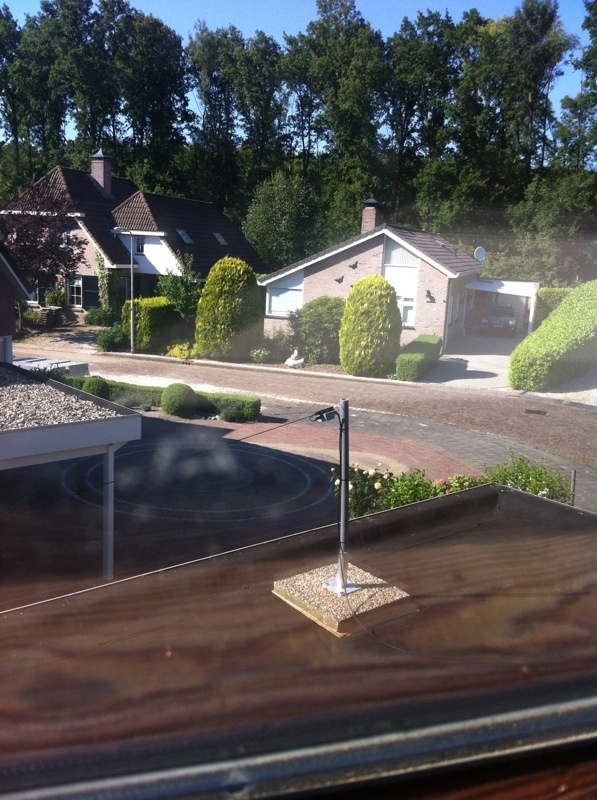 Hoi Rob en Ron ik had al een monoband antenne van jullie voor de 45 mtr deze heb ik i.v.m. plaats gebrek onderaan in een L laten lopen via een tussen mastje zie foto’s deze werkt geweldig en met een kleine inkorting helemaal 1:1.0 de meter komt nog niet los uit de hoek. Perfecte antenne goede resultaten super zeker een aanrader. The guys from Hyendcompany advised me to buy an antenna which was also suited for transmitting as for listening. I recently piked up an old hobby of mine and tried a great number of antennas (just long wire, mini-whip) and found it still very hard to listen to the radio due to the annoying noise on the line. Ron advised me to install an antenna suitable for the 40, 20 and 10 m band. After connecting the antenna to my receiver I was stupefied by the strength and clarity of the received signals. This will give me a lot of fun and the antenna will certainly be used for transmitting (after having passed the exam successfully). The quality of the antenna is superb, decent and strong materials are used and it is very easy to install. Ron thank you for your advise and quick delivery of the antenna. Ron bedankt en ik wens je alvast prettige kerstdagen toe. just a quick e-mail to thankyou firstly for a exceptionally quick delivery, i received the antenna nicely package the friday morning which considering i only ordered it a couple of days before is excellent service. I have installed the antenna behind the house just to try it out, as its going to be my /P SOTA holiday antenna, so its not staying up permenantly although judging its performance this last few days i just might be tempted to leave it up !!! On WSPR with 2watts i was heard in Australia, all over Europe and on the West coast of the USA in just one evening. Running 50watts on CW i have already worked Japan, all of Europe, the States and was getting nice Skimmer spots off the RBN network including ZL. Thanks again to the pair of you for a beautifully made product thats sure to prove its worth on my travels. Tunesië, Anguilla, Indonesia, San Marino , Egypte , Ascension Island en Columbia, Dus wekt echt wel de antenne Zelfs op 12 meter gaat het echt Prima met een AT 15 en 30 doen niets ook niet met de antenne tuner kan er ook prima mee op 80 in EU werken. zit op zo’n ruim 8 meter hoog terwijl het eind van de antenne op 10 meter zit. helder is en zelfs motiveert om met de antenne te experimenteren. heb, ga ik daar nog in knippen, volgens jullie beschrijving. hebt houd ik me aanbevolen. een hoop plezier van gaat beleven. Deze maand jullie 3 band antenne uitgetest op vakantie. en de box op de grond gelegd. 10 meter Aircell 7 en en Kenwood TS480 aangesloten. (20m) met VK stations in fonie en natuurlijk ook met verschillende Europese stations. met de motorhome. Foto's van de opstelling komen op www.on6zv.be. 1 Thuis in Hilversum, en 1 op mijn vakantieadres in Vierhouten. Wat een geweldige uitvinding zeg. Beide werken als een speer. Gemiddeld 10 dB harder dan mijn eigen pritswerk van voorheen. En dat na 23 jaar gelicenseerd te zijn, waarvan 21 jaar A amateur. Zo'n goede antenne heb ik nog nooit in mijn handen gehad. Echt geweldig. Hallo Rob PA3EKE & Ron PA3RK ! Rotenkogel 2.762 m in Kals am Großglockner mit eurer HyEndFed. De multiband antenne is beproefd in mijn vakantie afgelopen week in Zuid Limburg als sloper ophanging. Matchbox op 2,5 mtr. en einde draad op 9 mtr. aan een dikke tak in een boom. Veel landen gewerkt in Europa met mijn Ft 817 ND, met maximaal 5 Watt low power. Zowel op 20 als 40 mtr uitstekende sign. rapporten !!! !, met uitstekende swr !!. Top antenne met uitstekende prestaties, mijn dank !!!. Niets dan lof over de antenne. Heb hem vandaag opgehangen. Parasolvoet met paaltje van 1 meter op de dakkapel, van daaruit horizontaal (op 7 m hoogte) naar de Spar achterin de tuin, dan 3,5 meter bijna loodrecht naar beneden tot op 3,5 m hoogte. Op alle 4 de banden SWR 1: 1,5 of minder. Op 80m en 17 m is de antenne af te stemmen met de interne tuner van de FT-920, zal niet super efficient zijn, maar gaat wel. Heb m'n eerste QSO met de States op 15 meter vandaag gerealiseerd. Op 20 meter met 10 Watt diverse qso's gemaakt. in Europa. Had licht last van inpraten op zolder bij mijn zoon, dat heb ik opgelost met de gisteren meegenomen ringkern en nog wat ferrietstaafjes. Het stoorniveau van de signalen die de antenne oppikt is erg laag, signalen kunnen dus makkelijk doorkomen ook de zwakkere signalen. Kortom: zeer tevreden. Geld dubbel en dwars waard. Even een mailtje vanuit Malta. Jouw antenne werkt echt boven verwachting. Ik heb hem half op het balkon (4 mtr in een inv V op het balkon) en de rest(6 mtr) er over heen hangen in verschillende hoeken maar het werkt. De SWR perfect en ik heb al 54 DXCC's gewerkt en oja al de 5 continents in de wereld zelfs ZL - YB - USA- VE - YV - PR - JW en heel veel JA's. Ik ben er echt blij mee uiteraard helpt de middelandse zee ook maar wat een antenne. Ik probeer als ik thuis ben nog wel wat foto's te sturen. Voor de rest van de info kun je kijken op QRZ daar uit kan je opmaken hoeveel keer ik in de wereld bezocht ben en ander naar DX watch hoe vaak ik gespot ben allemaal mede door jouw kleine antenne. The antenna arrived safely today and was well packaged. I also installed it today. then the remainder of the antenna wire goes up towards the top of the 12m Spiderbeam pole. so it may need a few cm trimmed off the end. However, 20m and 10m work well. I use mainly the bottom end of 20m, and the bandwidth on 10m is very wide – easily the whole band. normally used to, compared to my previous antenna which was a 12m long wire via a 9:1 UnUn. I have been using PSK31 this evening, and working DX no problems, with 50W to the antenna. capable 40/20/10 End Fed for some time, so I am glad I found your website.